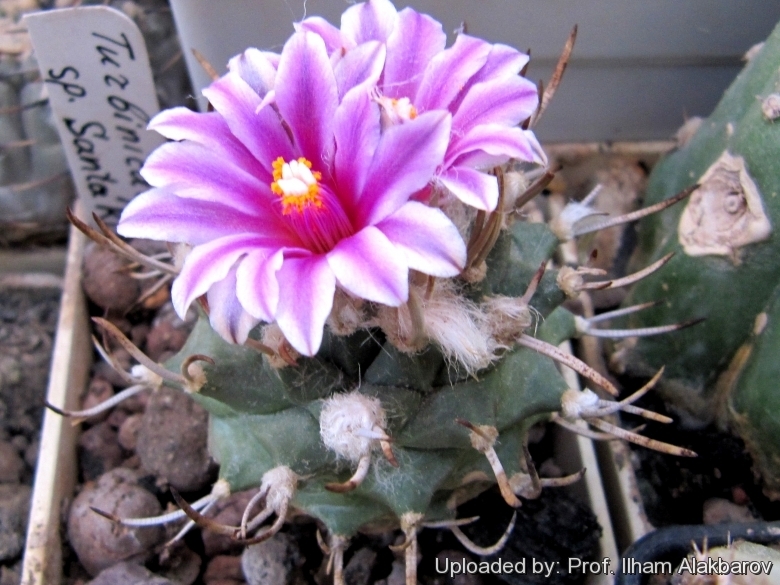 Description: Turbinicarpus sp. Santa Rita, a.k.a. Turbinicarpus schmiedickeanus var. Santa Rita or Turbinicarpus santaritensis, is a tiny form with magnificent and unique flower colouring revealing the difference. Stem: Solitary or slowly clumping semi-globose greysh-green to bluish-green globose, 3-5 cm in diameter (but often larger in cultivation). Flowers: Apical short tubed, tepals lanceolate, central strip bright purple, wider downward, margins of tepals pinkish white. Filaments purple, anthers golden-yellow to orangish and style pink, stigma lobes whitish. Cultivation and Propagation: It’s a fairly easy species to cultivate. It needs a very well drained soil, and requires strong sun to part sun to develop good spinal growth. Waterings should be rather infrequent, to keep the plant compact and avoid it becoming excessively elongated and unnatural in appearance. Keep dry in winter or when night temperatures remain below 10° C; it is hardy to -4°C for a short period. Assure a good ventilation.